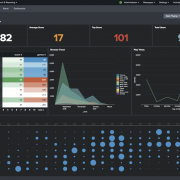 Team members of Discovered Intelligence were recognized for their global Splunk domain expertise at this years’ Splunk Conference in Las Vegas, scooping no less than two awards – Splunk Ninja and Splunk Developer! 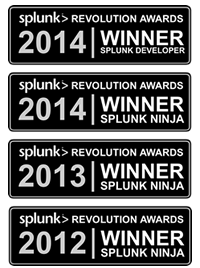 Our highly skilled DI team members have now been recipients of Splunk awards since 2012. Josh Diakun was the recipient of the Splunk Developer Revolution Award, recognizing his efforts in the area of Splunk Development. 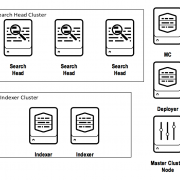 Josh has developed a number of Splunk apps over the years and continues to push the boundaries of development with many of our customers. 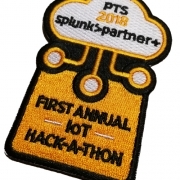 Derek Mock was the recipient of the Splunk Ninja Revolution Award, recognizing his efforts in the area of championing Splunk and his overall Splunk ninja expertise. 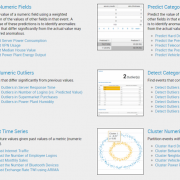 At his previous employer, Derek was instrumental in achieving a 200% ROI using Splunk. 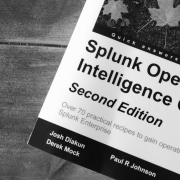 Additionally, both Derek and Josh are co-authors, together with fellow DI team member, Paul Johnson, on the newly published Splunk Operational Intelligence Cookbook.